King Ahasuerus’s second wife, Esther, learns that the King’s chief minister is plotting to have all the Jews in the Persian Empire massacred. Esther intercedes with the King and eventually he grants her request to spare her people. The intense colours create an impression of exotic splendour, while strong light heightens the drama. 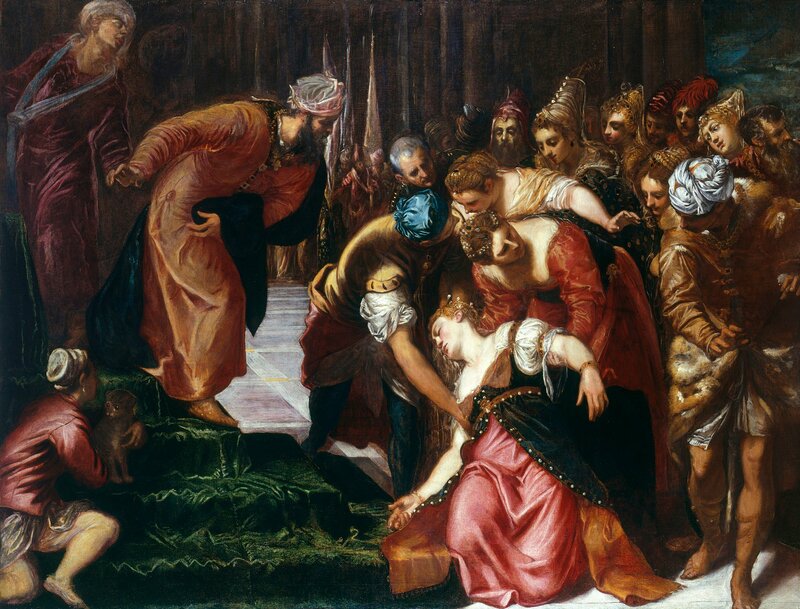 This painting has recently been dated to c.1546-7, just as Tintoretto’s career was about to take off with his first major commission, 'The Miracle of the Slave' (Accademia, Venice) of 1547-8. The story is told in the Book of Esther in the Hebrew Bible, to which additions were made when it was translated into Greek. King Ahasuerus, or Xerxes I, ruled the Persian Empire when the Jews were captive (485-464 BC). Esther, his second wife, conceals her Jewish identity from him and learns that Haman, the King’s chief minister, is plotting to have all Jews in the Empire massacred. Encouraged by her cousin Mordecai, Esther decides to intercede with the King on behalf of her people. She fasts, puts on royal robes and approaches the King, an act full of danger as it was forbidden, on pain of death, for anyone to enter the inner court without a royal summons. In the Greek addition Esther faints when she sees his face full of anger; then ‘God changed the spirit of the king to gentleness, and in alarm he sprang from his throne and took her in his arms until she came to herself’. Eventually Ahasuerus grants her request to spare the Jews and Haman is hung on the gallows he had prepared for Mordecai. Ahasuerus is described as ‘clothed in the full array of his majesty, all covered with gold and precious stones’; in the painting his golden robe originally had more orpiment - a bright yellow pigment. Esther enters with two maids, ‘leaning daintily on one, while the other followed carrying her train’; she is ‘radiant with perfect beauty, but her heart was frozen in fear’. Tintoretto was one of the first artists to show her fainting, a motif that linked her to that of the Virgin collapsing at the foot of the Cross. There is another version of the painting, on the same scale, in the Escorial, which is generally accepted as a workshop replica: in that painting two extra figures appear to the right and a kneeling boy in armour holds a banner behind the king. The same figure appears holding back a curtain in an engraving by Simon Gribelin after the Royal Collection painting made in 1712. In the present painting the boy is gone and two unfinished figures occupy the same position: a twisting man, with a long scarf around his neck, and a shadowy, turbaned figure. It seems that these two figures were part of Tintoretto’s first idea for the composition: the twisting figure could be Haman reacting to the events behind the King, his long scarf knotted about his neck alluding to his future hanging, and the turbaned figure is his companion. The artist must then have changed his mind, left these figures half-finished, and painted a boy in armour over them. Possibly at this point Haman was painted in similar costume, and his turbaned companion, with soldiers and banners, in the centre background. At some date after 1712, probably in the nineteenth century, an unknown restorer decided to remove the boy in armour (along with the curtain and a portion of the left background), presumably in order to ‘retrieve’ the two figures. Unfortunately the unfinished turbaned figure was damaged in the process, so presumably the same restorer replaced the boy in armour (with the curtain, surrounding background and the yellow highlights of Ahasuerus’s folds of drapery). At this stage the boy was at once ‘original’ (that is, reflecting Tintoretto’s final intention for the painting) and entirely repainted. He can be seen, clearly of inferior quality compared with the original areas, in reproductions made before 1950. When the painting was cleaned in 1950 the boy was removed and the ‘twisting’ and the ‘turbaned’ figures below were reconstructed. This solution was also adopted during the 1991 conservation. The consequence is that Haman appears twice in the same painting. In his 'Dialogo di Pittura' published in 1548, a few years after this painting was completed, Paolo Pino claimed that Tintoretto had set out to combine the drawing of Michelangelo and the colour of Titian; Ridolfi later claimed that Tintoretto had this motto written on his studio wall. A series of drawings of this period show Tintoretto studying Michelangelo’s sculpture and that of his Venetian contemporaries (by this time heavily influenced by Michelangelo). Tintoretto does not exactly quote from Michelangelo here, as he does in 'St Mark Rescuing the Slave' (1547-8; Accademia, Venice), but his confidently modelled, twisting and foreshortened figures clearly recall his work. We can also here detect the influence of a Florentine sculptor working in Venice, Jacopo Sansovino (1486-1570), whose turning pose of 'Mercury from the Loggetta', completed by 1546 (and studied by Tintoretto), can be related to the uncovered figure of Haman. In addition, the composition, with its crucial break between the King and Esther and the clearly defined space in which the events take place is indebted to the narrative balance of Raphael’s work, particularly such models as his cartoon for 'The Sacrifice at Lystra' (Victoria and Albert Museum). As in Tintoretto’s 'St Mark Rescuing the Slave', some areas, like the turbans of the men on the right and centre, are wrought to a high level of finish, while other areas, like the foot of a figure behind the man in fur on the right, are left remarkably free and unresolved. Both there and in Esther before Ahasuerus intense colours - blue, gold, white and crimson - create an impression of exotic splendour, while strong light heightens the drama. In the present work the light source is in the top left foreground, casting such deep shadows that it is impossible to read the expression of Ahasuerus, the principal character. These effects of light and colour are perhaps typically Venetian, but 'Esther before Ahasuerus' and 'St Mark rescuing the Slave' together mark a moment in Tintoretto’s career when his central Italian sources - Michelangelo, Raphael and Jacopo Sansovino - give a controlled energy to his figures which conveys a power and drama that is unprecedented in Venetian painting.